Could a Tree House Solve Your Housing Dilemma? These days you read more about homes being underwater than up in the air. But with more artists and architects building tree houses, some of today's coolest and most avant-garde homes are nestled in tree branches. Equipped with amenities including electricity, plumbing, heating -- even Wi-Fi -- big-kid tree houses provide a creative alternative to life on the ground and provide an airy escape from packed streets. Many are made from recycled materials and use eco-friendly systems like solar power and rainwater recycling. And, of course, you can't beat the views. Designed as a gift from a wife to her husband, the Peartree House (yes, it's in a pear tree) was built as a romantic getaway. Located in Heilbronn, Germany, and created by the Baumraum treehouse firm, the dwelling has a terrace that drops a few feet to allow the owners to hit golf balls off the landing to the lawn below. 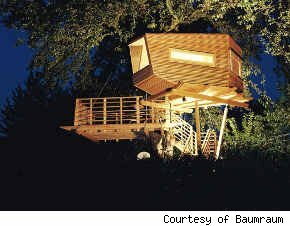 To make the design stand out, Baumraum architect Andreas Wenning, author of Treehouses--Construction and Design Manual, created the ceiling and walls using no right angles. While the tree house was originally created as a backyard escape from the hustle and bustle of daily life, well built modern tree homes can add significant value to a property. According to BusinessWeek Magazine, high-end tree houses can sell for anywhere from $7,000 all the way up to $1 million and usually wind up turning off many buyers but adding tremendous value for a select minority. While no statistics exist on the exact value the homes themselves add, Council of Tree and Landscape Appraisers says that mature trees alone add up anywhere from $1,000 to $10,000 to the value of a property. Artis t Sean Orlando says that one of the primary benefits of his ultrahip tree house is "you can see your enemies coming from a mile away." 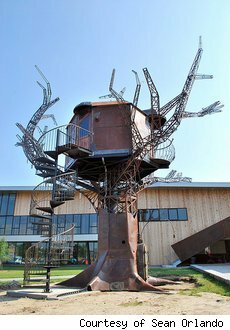 Designed in 2007 as an art installation for the Burning Man festival in Black Rock City, Nev., the home and 40-foot metal tree it sits in were created almost entirely from recycled and reclaimed materials by 60 volunteers in Oakland, Calif. 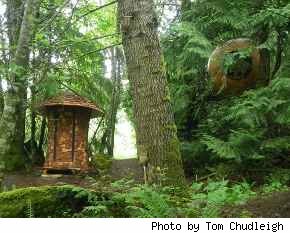 Created "to explore the relationship between our rapidly changing natural world and the persistent human drive to connect with it and one another," the 15-by-12-foot home cost approximately $60,000 to construct and contains a wood-burning stove to keep it warm, a telescope for bird-watching, and a steam calliope for creating music. The surrounding metal "tree" is equipped with LED lights in the branches (giving it a post-apocalyptic firefly effect) as well as a steam generator for spooky effects at night. 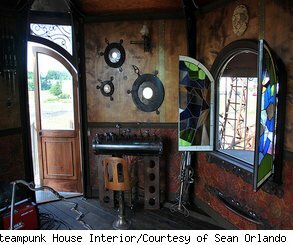 While the treehouse doesn't have a kitchen or bathroom, it does have an amazingly Jules Verne-ian interior complete with stained glass windows and Tim Burton-esque furniture. Both the house and tree have taken up permanent residence at Dogfish Head Craft Brewery in Milton, Del. 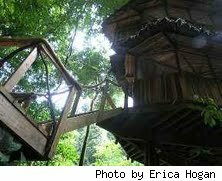 Tree houses that act as second homes have more real estate value than those that operate without plumbing; however, they can make for novelty overnight housing. To turn his tree house into a money-maker, Wofford Heights, Calif. resident Mike Lane transformed his plumbing and electricity-free place into an apartment. Part "Jetsons," part alien spaceship , the concept tree-dwelling designed by Sybarite Architecture and Design of Chelsea, London, consists of modular pieces that can be hauled up above the treeline to create a whole new breed of canopy-dwellers. Comprised of (mostly) recycled materials, the home uses solar and wind power for electricity, collects rainwater for home reuse and can be built as a studio, or all the way up to a five-bedroom home -- complete with rooftop play area, elevator, cloakroom and optional rooftop Jacuzzi. 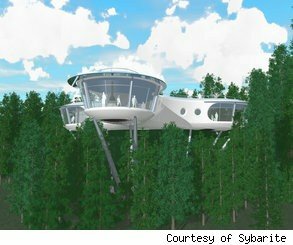 While the design was created for treetop life, Sybarite says that the model could be used to construct similar homes on steep mountain slopes or low-lying forest valleys, turning formerly unusable land into valued property. While the design hasn't been built (yet), the concept does raise a number of possibilities for the future. Next time you find yourself wandering through the woods of Vancouver, look up. Hanging from ropes far above the earth's surface, spherical homes house adventure-seeking adults looking for a great escape. Designed more as private treetop hotels rather than permanent homes, the spheres come equipped with beds, microwaves, refrigerators and heaters. Guests have to venture into the wilds of Vancouver to scavenge for food at local restaurants. "The spheres are all about unity and oneness," says Free Spirit Spheres founder Tom Chudleigh. "Architecture is a way of shaping and creating habitat to reflect a feeling and to harmonize with the environment. The sphere is a form of architecture that reflects that thought and feeling of oneness." It started with a surfing trip to Costa Rica and ended with an entire treetop community built by two kids from Colorado. After riding the Costa Rican waves with her husband, Matt, in 2006, Erica Hogan loved the country so much that she wanted a house there. "We wanted a fixer-upper surf shack or a bungalow in the rainforest," she says. "The idea was to create something simple." After literally machete-ing their way down to the banks of the Rio Bellavista, the couple found the perfect spot -- a 62-acre riverfront property located in the middle of natural nothingness. Since they couldn't afford the property on their own, Erica pitched the concept to friends. "I threw the idea of building a tree house on the table, but we knew that the parcel [of land] was far bigger than what we needed or wanted," she says. "I thought maybe friends would be interested in going in, then I thought that maybe they would like to build tree houses, too, and we could connect them with zip lines and bridges and make an Ewok village like the one in "Return of the Jedi." Today the property is beyond what Erica originally imaged. The tree-house community has grown to 300 acres, with 45 parcels sold to private owners. There's a community center, community kitchen, Wi-Fi zone, lounge and bathhouse. Homes currently cost anywhere from $35,000 to $150,000 to construct and can span from one to 10 trees. Unsurprisingly, they're eco-conscious as well. Unit owners have the option of recycling rainwater, and the tree house community connects into a vast "Skytrail" network of bridges to allow neighbors to visit each other. "Life at the Finca is probably more rustic and simpler than most communities in the conventional world. But I can honestly say I lack for nothing in terms of necessities or amenities," says Hogan. "It's certainly different, but that's why we love it so much."